My daughter has recently been diagnosed with Celiac. It’s been a struggle to find a restaurant that understands the seriousness of what gluten cross contamination can do to her. Michael at LaVilla absolutely gets it! When he found out we were ordering gluten free because of her Celiac he sat down w us and explained how everything is done here. He truly cares and made us feel completely at ease that she can eat here without fear...then there was the actual gluten free food. She ordered the baked ziti gluten free. She said it was amazing and tasted just like the regular baked ziti. We even tried it and it was delicious!!!! Thank you LaVilla and Michael for knowing so much about Celiac and taking the time to care for our family! We are forever grateful and you will always be our top choice!!!! The food was delicious and everyone is so friendly from the owner and his nephew who run the show, to the servers and everyone else there. We were in town for a sports competition and we ate at this restaurant for every meal and never got bored. There is a perfect meal for everyone on this menu. Thank you Michael and Dominick (especially for the whole wheat pasta). We miss you already. You rock! The only REAL Italian place to eat!!! I can't say enough good things about LaVilla. It is our go to place when we want Italian food. The service and food are the best around . Thanks Mike and staff !!! There are tons of choices, including sandwiches because they also have gluten free bread. I have had many pasta dishes, pizza, and the chicken and cheese sub is great! Great restaurant run by a great family! THE CHICKEN SCAMPI IS THE BEST!!!!!!!!!!!!!!!! I have never been disappointed with this restaurant! From the service to the food, the friendliness of the staff to the fact that the owner always says hello and personally makes sure you are totally satisfied, you simply won't find a better all around dining experience. I try something new every time I visit and it blows my mind every single time. You won't get bored with the menu, either; they are constantly adding new items. Five stars all the way! Being from New Jersey and from an Italian family, I know Italian food. I have lived in Florida, NC, and Virginia and haven't found real Italian food until I ate here. Every time I eat there, I feel like I'm eating with my family again. I have never had one bad meal there and look forward to eating there. If you are looking for real Italian food, family environment, great prices than la villa is the place to go. There is no other Italian restaraunt I have been to that can compare to La Villa. Got a gift certificate.....used it.....ate there and it was really really good. Would recommend the restaurant! Mike and his staff are amazing! He's been providing high-quality gluten free items for years and they work diligently to avoid cross contamination. By far, the best gluten free pizza and gluten free pasta in the world. His food is even better than what I had while traveling in Italy. La Villa was my favorite restaurant before having to transition to a gluten free diet for medical reasons. I thought I would never enjoy gluten free Italian, but La Villa remains my favorite restaurant. Already being delightfully satisfied customers of La Villa, we decided to have them cater an after-rehearsal dinner we were hosting. We could not have been more pleased with the experience. The food was delicious, and the owner and staff were wonderful to work with. We selected three entrees and supplemented with pizza. When we asked to make a couple of ingredient substitutions to satisfy personal preference, their response was, “No Problem!” They also double-sliced the pizzas per request. The food was ready at the agreed upon pick-up time, and assistance was provided carrying it to the vehicle. Due to travel time, we picked up the food 45 minutes prior to the scheduled start of the event. Then, even though we had to delay an additional 30 minutes due to late arrivals, we were delighted that the food was still hot when we removed the covers to begin service. The entrees really do feed the number indicated. We ordered a little extra, and although we enjoyed the leftovers, it was not necessary. Bread is supplied with the entrees, so you only need to order bread if you want additional. Based on all the compliments, the food was enjoyed by all, and everyone ate their fill. Thanks, La Villa, for the wonderful food and experience, as well as a great value. Excellent pizza! Better than pizza huts. Keep it up. We have dined here several times. The food is great! Staff is friendly and efficient, Can't beat the prices. The owner knows you when you walk in and stops and talks to everyone like they are family. Our favorite restaurant in Lynchburg area... we love Italian food and La Villa serves the real (authentic) thing! Great atmosphere, staff and servers... recommend to any and all. We've become lunchtime regulars....2-3 times/wk. The lunch menu, especially the sub section, is a great, tasty value. The atmosphere, service, and friendliness add to a great lunch venue. Highly recommended. Finding La Villa to have gluten free options is fantastic! I have Celiac Disease, therefore I am very cautious with everything I eat. 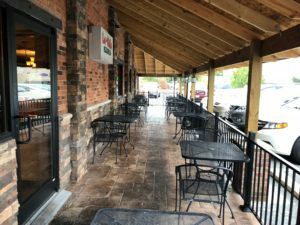 I am very comfortable eating there; I have not had any reactions what so ever eating here:) This is the only Italian Restaurant in Lynchburg I eat!!! This is my favorite restaurant, hands down! Everything on the menu is amazing...and many options are also GLUTEN FREE!! La Villa has the most gluten free food options that I have ever seen in any restaurant. Pasta, pizza and even subs! As someone who has such limited menu choices in most restaurants, at La Villa, I have a huge selection to choose from. The food is amazing and the owner is just as great!! When you're there, you're family! So glad we found La Villa! We are new to Lynchburg, and our family was thrilled to discover La Villa. We are from the NYC area and know excellent pizza and Italian food well. Lynchburg families are so lucky to have this great restaurant in town. My husband and I LOVE this place! The food is excellent and the owners are amazing. We go here at least 1-2x a month! I cannot express how good it is! 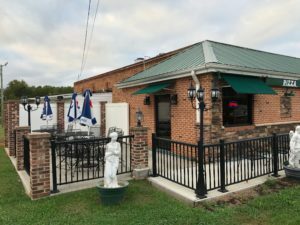 For years my husband and I have worked on honing in on our favorite go-to places to eat, and Lynchburg has a TON of restaurants. Somehow we found La Villa, and I have absolutely fallen in love. That is where I send anyone who is even talking about going out to eat. The owner is friendly and welcoming every time we come, and he always makes the kids feel special with his "free" ice cream too. The food is so, so, so good. Everything from the starter garlic knots, to the pasta trio sampler, to the stromboli, to the pizza--everything is phenomenal. Flavors are authentic, and appearance is great. Everything about La Villa is appetizing! The atmosphere is very casual, so if you are looking for fancy, go elsewhere. If you are looking for delicious, warm, and comfortable, this is your place. Thanks, La Villa--we'll see you next week! First visit in a long time. Dinner was excellent, service was top notch. Large mussels ... New seating area was very comfortable. Will return next time we seek Italian food. My wife and I discovered La Villa by accident. We were looking for a place to get pizza that wasn't a chain restaurant. We had a coupon for another place, walked in and walked out and decided to check out La Villa when we passed by. I am so glad we did. Great service, fantastic food. Best Stromboli ever! And veal!! All is delicious!! My daughter just recently moved to Lynchburg and she is allergic to gluten so we found our way to La Villa. Every time I visit I have to get something from La Villa!! This past weekend I had the Veggie Boli and it was the best I've ever had!!! Love, love, love the pizza at La Villa! Definitely the best I've had. I can't even eat pizza from the commercial places anymore. Made with love of cooking! Delicious food with authentic, made from scratch cooking. Service that makes you feel like a cherished customer. Food is prepared and served with pride. Large portions. We love La Villa for Sunday dinner or week-day lunch. Prices are good. We used the banquet room for my daughter's graduation party. Everyone was extremely cordial and helpful. The food was exceptional! I will go back again and again. Thanks, La Villa! we have been making a weekly trip there for several months now! Super friendly-kid friendly with complimentary DVD players for them plus free ice cream and the pizza is awesome!! I have been to what are considered the best Italian restuarants on the East Coast. From New York to Florida I have tasted it all and Michele DiGiovanni's restuarant is by far my family's favorite Italian restaurant. We will drive several hours just to eat at La Villa. The atmosphere and menu is the most authentic Italian you will find here in the U.S. Michele and the DiGiovanni family make us not only feel welcome at La Villa, but they make us feel like a part of thier family each time we walk into the door. Sincerely, the most authentic taste of Italy this side of the pond. I will always rank La Villa on top. Amazed with the atmosphere, food, and friendly staff. Mike and his whole complete staff never seize to amaze me. The quality of the food is excellent and the customer service is out of this world. Thankful for this amazing restaurant where you truly feel like family and not just a customer. I love going to La Villa! The owner is always so sweet and welcoming. The servers always have a smile on their face and the food is delishhh! "have not had a meal as delicious as LaVilla's"
I have eaten Italian in New York City and have not had a meal as delicious as LaVilla's! Michael DiGiovanni's attention to every detail makes dining a feast for the taste buds. "La Villa is a fabulous place to gather with friends"